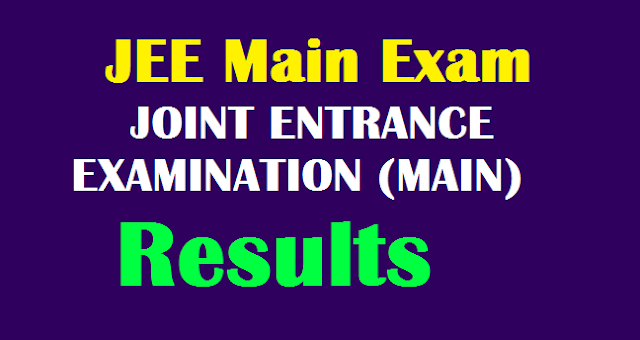 JEE Main Exam Results 2019 to be declared on January 31st @ jeemain.nic.in Joint Entrance Examination (Main) 2019- With Rank (Paper I and Paper II )JEE Main Result 2019 JEE Main 2019 Results declared Check Score Card and All India Rank | CBSE JEE Main 2019 Result jeemain.nic.in JEE Main 2019 Results Declared, check results, scores online now now at cbseresults.nic.in The results of JEE Main 2019 Results have been declared at the official website. Aspirants can go through the scorecard, All India Ranking (AIR) at the official website jeemain.nic.in and cbseresults.nic.in JEE Main 2019 Result Check Score Card and All India Rank | CBSE JEE Main 2019 Result JEE Main 2019 Results are expected today at the official website jeemain.nic.in. Candidates who had appeared for the paper and pen mode as well as the computer based examinations should be able to check the results on the official website today. This is important to note that there is no fresh update regarding the declaration of the results. The results are expected today as per the official notification released at the time of application forms of JEE Main 2019. The Results are likely to be made available by CBSE on 31-01-2019 as per sources. Students would require their JEE Main Admit Card numbers to access their JEE Main 2019 Results. NTA Declares JEE (Main) January-2019 NTA Score JEE Joint Entrance Examination Main Exam Results 2019 to be declared on January 19th : JEE Main Exam Results 2019 : The results of join examination will going to released by the NTA. All the candidate who are appered in the examination are required to check the results and rank of paper-1 at the Official Website jeeemain.nic.in. The first JEE (Main) Examination was conducted by NTA between 8th and12th January, 2019 in two shifts per day across 258 cities in the country and abroad. A total number of 9, 29,198 candidates were registered for Paper –I (B.E. /B. Tech.) in this examination. There were 467 examination centres across the country and abroad. A total number of 566 Observers, 254 City- Coordinators and 25 State Coordinators were deployed at these centres to oversee the smooth and fair conduct of examination. The Paper-I was conducted in a total of 8 shifts from 9th to 12th January 2019. The results of Paper- I have been declared today. ‘*’ NTA Scores are normalised scores across multi session papers and are based on the relative performance of all those who appeared for the examination in one session. The marks obtained are converted into a scale ranging from 100 to 0 for each session of examinees. 2. The NTA Score indicates the percentage of candidates that have scored EQUAL TO OR BELOW (same or lower raw scores) that particular Percentile in that session. 4. The NTA Score of the Total is NOT an aggregate or average of the NTA Score of individual subject. 5. NTA score is not the same as percentage of marks obtained. 6. Candidate’s particulars including Category and Person with Disability (PwD) have been indicated as mentioned by the candidate in the online application form. 7. After the JEE MAIN APRIL-2019 Exam , the Ranks of the candidates will be released taking into consideration better of the two NTA Scores of all candidates appeared in JAN 2019 and APRIL 2019 examinations and in accordance with the policy already made available on the website https://jeemain.nic.in. 8. NTA Score for Paper-II (B.Arch. &B. Planning) will be declared later on. 9. The Examination was conducted completely in CBT mode for the first time. 10. For the first time, the candidates have the choice to appear in one/ two examinations for admission. 11. In order to make the examination system transparent, the Question Paper and recorded responses were displayed in the website for the verification by examinees. 12. To ensure accuracy and transparency of result, the keys of question papers were displayed in advance to invite challenges by the candidates. 13. For the first time in nationwide competitive examinations, live CCTV Surveillance was carried out. 14. Jammers were installed at the examination centres to prevent unfair practice by the candidates during the examination through mobile or any other electronic device. 15. The next online application for JEE (Main) April-2019 Examination shall start from 8th February and shall remain open till 7th March 2019. The uploading of images and payment of the application fee will be upto 8th March-2019. 16. The JEE (Main) April 2019 Examination will be conducted in CBT mode between 6th and 20th April, 2019. Admission to NITs, IIITs and CFTIs participating though Central Seat Allocation Board will be based on All India Rank (AIR).or SC/ST candidates the qualifying marks would be 65% in the 12 th class examination. Subject combinations required in the qualifying examination for admission to B.E./B.Tech.& B. Arch./B.Planning Courses in NITs, IIITs, and other CFTIs has been given in the official website. Students are advised to keep checking the official website for details.CBSE conducted the JEE Mains examination in the month of April 2019 A huge number of candidates applied and appeared for the examination. Candidates who had written the exam can check JEE Main 2019 Results from the direct link provided below and download result with score card/ rank card name wise with photo. Along with the announcement of JEE main paper 1 result on 31st Jan 2019, JEE Main cut-off has also released officially. The cut-off will be available via online mode through the official site. The cut-off marks will be set according to the categories, candidates appeared and difficulty level of the exam. below we are giving the last year cut-off for reference only. Around top 2 lac candidates may be allowed to appear the second stage of JEE exam (JEE Advanced). The Central Board of Secondary Education (CBSE) declared JEE Main 2019 results. JEE Main Result 2019 declared on April 30, JEE Main 2019 Result DECLARED, check results, JEE Main 2019 Result is out - Get result from Official site‎ jeemain.nic.in JEE Main 2019 results out Here's how you check it here direct links provided to check JEE Main Result 2019 http://cbseresults.nic.in/jee_main_zxc/Jee_cbse_2019.htm . Aspirants can check the CBSE JEE 2019 Results from the direct link provided below. For the academic year 2019-20, as many top candidates of JEE Main 2019 will be qualified for appearing in JEE Advanced 2019. Examination Date May 2019. The entire JEE (Advanced) 2019 Examination will be conducted in fully computer based test mode.